To be clear, I love this quilt. I love using Essex yarn-dyed linen in my quilts, and I am constantly inspired by menswear pattern, texture, and color. This was my very intentional stab at mixing colors I don't normally consider together, some prints, and a whole lot of randomness. Nine patch is a classic quilt block and basically the first thing you learn when you learn how to piece or patchwork. I would also like to add that it is probably one of the most satisfying blocks to make, nesting all those seams, and watching the five/four pattern take effect in each block and as the whole piece comes together. I used red pearl cotton thread to hand quilt a very lovely grid across the whole quilt. 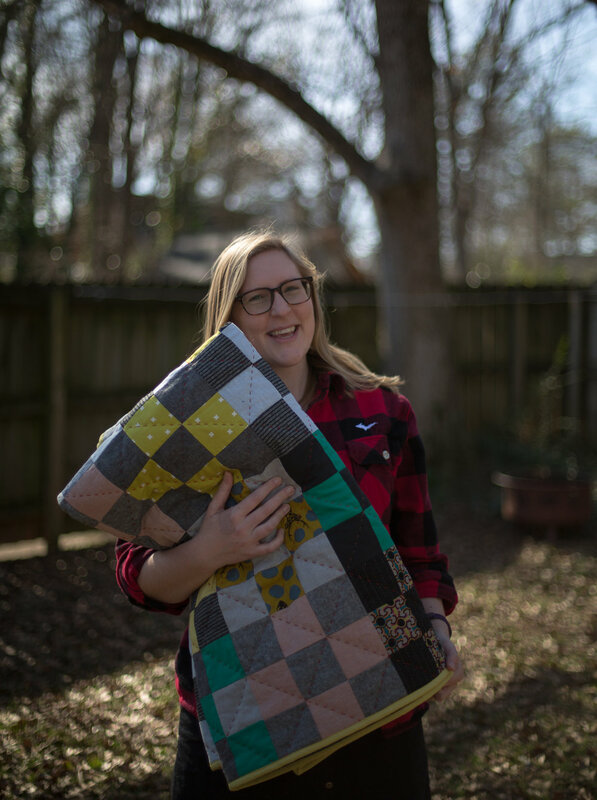 It's backed in Mammoth flannel, very random color combinations that were still in stock by the time I decided what to do with Mammoth flannels --again, my love for menswear meant that I was determined to eventually find a reason to use them in a quilt. This was my first stab at polyester high-loft batting in a quilt too, so it's very cushy and cozy, especially paired with the flannel. I will be sending this quilt off to a very special family member, and I have daily pangs of quilt separation anxiety when I think about parting with this guy. But, that is the sign of a well-loved and well-made quilt.